A microcurrent facelift is a non-surgical, non-invasive cosmetic technique that safely and effectively improves the health and appearance of the skin. A microcurrent facelift uses technologies developed in the medical and physiotherapy fields to activate the skinâ€™s natural chemicals responsible for health and vitality. A microcurrent facelift provides satisfying aesthetics results with less risk of side effects compared to a traditional facelift. The microcurrent facelift procedure is proven safe and effective, delivering results at a fraction of the cost of traditional procedures. Reduce and eliminate fine lines and wrinkles, improve facial circulation, skin exfoliation, lymphatic drainage, sun damage, skin pigment improvement, product penetration and more. A microcurrent facelift utilizes microcurrent technology which uses gentle electrical stimulation to trigger the bodyâ€™s natural skin enhancement chemicals at a cellular level. Clinical studies have shown that after twenty days of treatment, collagen production increases by 14%, elastin increases by 48%, and blood circulation increases by 38%. Scientists have also found that microcurrent facelift treatments trigger the bodyâ€™s production of amino acids and ATP. Both of these accelerate cellular repair and promote healthier cell production. The best candidate for a microcurrent facelift is anyone wishing to maintain or gain a youthful appearance. Younger clients seek a microcurrent facelift to prevent some of the aesthetic effects of aging. 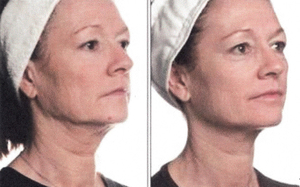 Older clients can be rejuvenated by having a micro-current facelift. How long and how often is the treatment? The microcurrent facelift procedure itself takes approximately one hour to complete and is virtually painless. A microcurrent facelift specialist will use two pronged instruments to gently deliver electrical stimulation to the muscles and tissues of the face and/or neck. The microcurrent facelift procedure request no anesthesia, no recovery time, no downtime from work, and has no irritating side effects. To achieve the ultimate benefits of a microcurrent facelift, approximately twelve treatment sessions are recommended. Routine follow-up treatments are performed to maintain microcurrent facelift results. Microcurrent technology is the latest in skin care. This system is a safe and effective alternative to BOTOX, fillers, extreme peels and surgical lifts. Most people see results after just one treatment. THIS IS THE NATURAL WAY TO ACHIEVE THE RESULTS YOUâ€™RE SEEKING. YOU WILL LOOK LIKE A YOUNGER, MORE VIBRANT VERSION OF YOUR FORMER SELF. Visible firming and contouring, lifting overall drooping features.